Darrin was leaving the sanctuary that was releasing over 6000 attendees from the Sunday morning worship service. His spirit was elated with the Heavenly fruit of the Spirit and the joy of the Lord was upon him. In transit towards the west wing exit, he was met by one of the brothers from the church choir. Arthur was notorious for being a zealous soul, full of gratitude for His Savior’s love. On this day Arthur’s head was hung low as he walked directly into Darrin’s right arm. The meeting was surprising to Darrin as he embraced Arthur to slow him down. In the moment that Arthur realized it was Darrin now holding his arms firmly as he saw his lips moving but was unable to hear the words. Arthur was overwhelmed by the noise in his mind as the thoughts of terror associated with the loss of his life-savings plagued him thoroughly. He too was in the same service. How is it that 2 Christian men can be in the same church service and leave with 2 different realities? Matthew 15:18 But those things which proceed out of the mouth come forth from the heart; and they defile the man. 15:19 For out of the heart proceed evil thoughts, murders, adulteries, fornications, thefts, false witness, blasphemies: 15:20 These are the things which defile a man: but to eat with unwashed hands defileth not a man. and 5:22 But the fruit of the Spirit is love, joy, peace, longsuffering, gentleness, goodness, faith, 5:23 Meekness, temperance: against such there is no law.Gal 5:24 And they that are Christ‘s have crucified the flesh with the affections and lusts. 5:25 If we live in the Spirit, let us also walk in the Spirit. Gal 5:26 Let us not be desirous of vain glory, provoking one another, envying one another. Arthur was overwhelmed with a heart that was actively being humbled as a result of the affairs in his life. Today he was made to realize how sin sick he had become. He was a hard worker and quite successful at making a living. His long-term relationship with his wife and children ended abruptly as they were killed in an accident. He was left with a brain injury from the accident that rendered him disabled. He was no longer able to drive himself around after the incident. Public transportation and help from others were his transportation options after years of self-sufficiency being mobile. He was learning to live alone without any direct interaction from family after years of having direct family involvements. And now, in the past week, he learns that a man, who he met in church and trusted to manage his life savings, took all his money and now his life’s brokenness includes financial hardship. Arthur was overwhelmed with the internal dynamics of the “how” and “why” questions. His heart was consumed with grief and his flesh wanted to retaliate in some way. In fact, he desperately needed to escape this pain by any means necessary. He was perplexed with the thoughts of how he could end it all and go home to be with the Lord. Yet, he was determined to trust God. In the church service they were leaving, the pastor delivered a powerful message. I Peter 5:6 Humble yourselves therefore under the mighty hand of God, that he may exalt you in due time: The sermon title: HUMBLED TO FIND HUMILITY. That stung Arthur’s heart but good! Arthur’s trust in God included regular church attendance. The payoff for his commitment initiated. In the midst of all his loss and his need for human involvement after loosing all family ties, his heart was still egotistical, prideful and driven by a spirit of human arrogance. With all the loss, he still had a human will to “be strong and never let them see me sweat” attitude. In his alone time he was consumed with anger, envy, hatred, wrath, strife and the works continued to manifest. His current living conditions, coupled with a regular spiritual battle with God’s unending love, was a recipe that called for God’s intervention. The pastor proclaimed, “GET LOW BEFORE CALVARY AND FIND HUMILITY.” Arthur was stunned with the truth in the power of the cross. Arthur was too weak to answer but troubled nonetheless. He stayed in place throughout the rest of the service. The time came to exit. He walked aimlessly through the vestibule in fear of what he would do to himself if he left the building. The fear and uncertainty became so overwhelming as he made up his mind to go. Just then he ran into Darrin who grabbed him and would not let him go. “Give me a clean heart. So I may serve Thee. Lord, fix my heart so that I may be used by Thee. For I’m not worthy of all these blessings. Give me a clean heart and I’ll follow Thee. I’m not asking for the riches of the land. I’m not asking for high men to know my name. Please give me Lord a clean heart so that I may follow Thee. Give me a clean heart and I’ll follow Thee. I am up sometimes I am down. Sometimes I am almost level to the ground. A song that Arthur sang in the choir years ago, that would illuminate his zealous spirit so many times during choir rehearsals and worship services, was now ministering to Arthur’s troubled heart as the inhabitants throughout the vestibule – transient and gathered – joined in on the singing of the chorus. Arthur was now standing upright, his head held up and his facial countenance being restored through the illumination of the Holy Spirit. The tears streamed down his face as the joy of God’s presence lifted his heart and his arms were now lifted up high above his head as he sang to the Lord, pleading for God to fix what was broken. Arthur’s sorrow, as he was obediently yielding to the truth of his inferiority and need of God’s superiority, allowed him to find the willingness to modestly and respectfully stand in the presence of God and receive the healing his heart desperately was in need of. The praise in the worship service continued in the vestibule as the unity of the saints worked together with the Spirit of Christ and a humbled heart found the grace and love of God in due time. Arthur’s commitment to trust God resulted in newness of life that day. like Darrin,his instinctual fervor for a conqueror lifestyle is serving him and others today. God is good ALL THE TIME. I apologize for the delayed response. I took some time off to get some much needed travel in. Thank you for your comments. 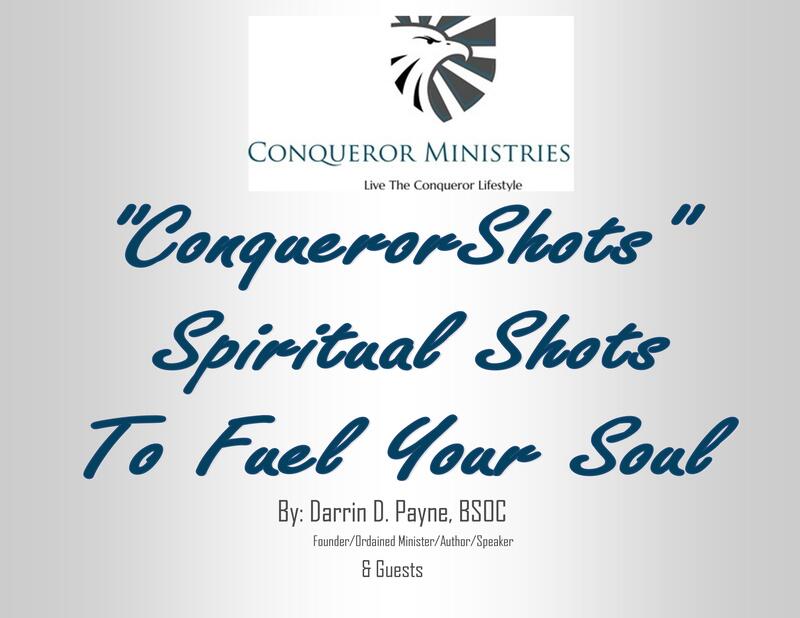 ConquerorShots was the 1st public forum for the ministries. I hope you will be spiritually blessed by the many “shots” available to you. I also follow “Revelations In Writing” and “Fresh Oil.” The 2 also coincide with the overall theme of CShots. Please feel free to connect with us any time here and enjoy the many leads available through our main website http://www.conquerorministries.org.